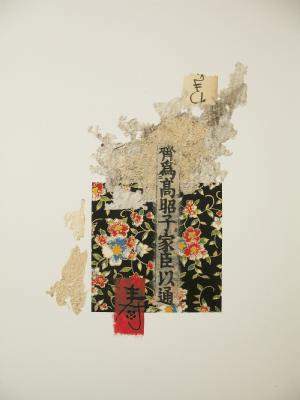 “Origami,” a collage by Mary Ellen Long, is one of four pieces the local artist will enter in the Durango Arts Center’s “Open Doors & Open Studios” juried exhibit. One of the Durango art community's most anticipated events still is more than two weeks away, but there's no calm before the storm for Crystal Hartman, who still was working hard Monday to ensure the Durango Arts Center's latest exhibit will open on time Wednesday. "I'll go 10 days of work, work, work, and then melt down on the 11th, then I get up and start another 10 days," Hartman said. She's the driving force behind not only the DAC's "Open Doors & Open Studios" exhibit, but also for the larger Durango Open Studios weekend, when more than 75 artists in 22 locations will open their workplaces to public scrutiny later this month. But first things first. The DAC exhibit is separate from the studio tour, but it will feature a sample of 27 of the participating artists as a preview. Hartman finalized the deal for the Barbara Conrad Gallery in July and had about three weeks to collect enough artwork to fill the space. Her challenge was made all the more difficult because "Open Doors" comes on the heels of the "20/20" exhibit, which showcased the cream of the crop of the veterans of Durango's art world. "It worked out perfectly. The DAC needed a September show, and I need space for more art," Hartman said. "We have generations of artists in this show, and some are very young." Only 10 of the artists in the exhibit will be eligible to win the juried portion; the balance are loaning a few items that will be featured in the Open Studios tour, which begins Sept. 26. The juried artists are Michaela Griffin Cordes, Amy Vaclav-Felker, Katey Fetch, Susie Gillatt, John Grow, Adele Kurtz, Mary Ellen Long, B. Summer Lynch, Strider Patton and Jinah China (a partnership of artists Jonah Skurky-Thomas and Micah Bell). Grow, Kurtz, Long, Lynch and Jinah China also will participate in the Open Studios tour. The mix of artists should make for a visual feast, and nearly every conceivable artistic medium will be well-represented. Highlights include, but are not limited to, Grow's graphically surreal oils; Fetch's watercolors; and the exquisite, if not downright racy, ceramics of Jinah China, which must be seen to be appreciated. Most of the artists will be on-hand for an artists' reception during the Fall Gallery Walk on Sept. 18. For Hartman, "Open Doors" is the beginning of the end to a journey that began last winter, and she can finally see the finish line, which she'll cross Sept. 27 when the Open Studio tour comes to a close. "I didn't want to commit to it unless I knew I could do it full-bore, and I've done that," she said. "It's all just happening for me, and it feels really personal."